Escalating a dispute with a Chinese joint venture partner, French dairy and water company Groupe Danone SA said Tuesday it filed a lawsuit in Los Angeles over alleged illegal sales in China. Danone said it filed a complaint Monday in the Superior Court of Los Angeles County against Ever Maple Trading Ltd., a British Virgin Islands-based company, and Hangzhou Hongsheng Beverage Co Ltd., and two individuals related to these companies. Ever Maple Trading is the controlling shareholder of Hangzhou Hongsheng Beverage, the parent company of Danone's joint venture partner, Hangzhou Wahaha Food and Beverage Sales Co., Danone said in a legal notice. Danone has accused Hangzhou Wahaha, one of China's biggest domestic beverage makers, of illegally selling products identical to those sold by the companies' joint ventures. "Groupe Danone has filed this U.S.-based complaint to put a stop to the defendants' collective scheme to wrongfully interfere with its customer relationships and business prospects," it said. "Our objective is to stop the illegal production and sales of products using the Wahaha suppliers and distributors and under Wahaha brands," it said. Danone would not disclose the amount of compensation it is seeking for "loss and damages." Wahaha officials could not immediately be reached for comment on the lawsuit. Danone said it filed the lawsuit in Los Angeles because that is the location of Ever Maple's registered address. One of the two plaintiffs named in the lawsuit is Kelly Fuli Zong, who Danone said is the legal representative of Ever Maple and a daughter of Wahaha Group's chairman Zong Qinghou. The company did not give a name for the second plaintiff, who it said was also related to Zong. The feud between Danone and Wahaha surfaced several months ago, when the senior Zong publicly rejected a plan by Danone to buy out some of Wahaha's assets, accusing the French company of attempting a hostile takeover. Danone and Wahaha began establishing their joint ventures in China in 1996 and their beverage operation has become one of China's largest. 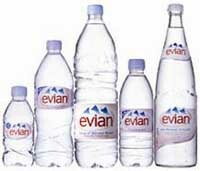 Last week, Danone announced that Chinese authorities seized five containers of Evian water bottles in February, citing concern over high bacteria levels. Danone said Chinese sanitary standards for water were designed for treated water, not natural mineral water, which contains more bacteria than processed water.